Western Bottle News: Checked Your Bottom Lately? Since Rick started this subject, here is another ad I researched for a soda water bottle collector, this gives you a better understanding of how this came about. A while back I wrote a post titled “The Blue Soda Hole”. Basically a couple of hombres and I dug a small gold rush pit late one afternoon and recovered several blue sodas with iron pontil bases. When we finished the pit it was getting dark and I snapped a couple of pictures to possibly use in a post for this blog. When I posted the pictures on the blog I referred to the blue sodas as having “red iron pontils” – That was before I really examined one of the bottles. After giving one of the Mineral Waters a nice warm bath I noticed that it didn’t have a red iron pontil after all. What it had was red paint over the iron pontil..... Very interesting I thought and left it at that. A few days, or weeks, or it could have been longer or sooner (I have a time space thing happening as I get older) I mentioned the painted bottom sodas to Warren in a casual conversation. Of course Warren had seen sodas with painted bottoms, and in fact, knew why the bottoms were painted (which didn’t surprise me one little bit). .............Oh boy another mystery to try and unravel, might as well add it to the date and time of the western curved “R”, the Fish’s Infallible western or eastern brain twister, the Mlasko T*M western star and Dale’s maybe it just might be possible that the Chalmer’s Catawba Wine Bitters is a 25th anniversary of the discovery of gold in California bottle theory. Wow..... Its no wonder I have this time – space thing happening. Warren also mentioned that he had seen other bottles with different colors painted on the bottoms and possibly the reason for the different colors were the bottles belonged to different merchants. A number of years ago, several Cutter fifths were dug in Nevada that all had the bases painted green. Yep, I dug them in Belmont, but it was in 1974, a bit more than "several" years ago. I believe that those bottles, most of which were mid crown E. Martins,had the bases painted so that they could be returned to the saloon for refilling. I'd like to know what they were refilled with. 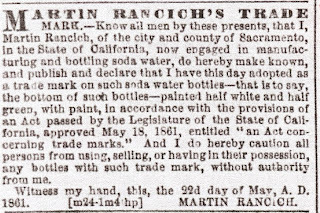 It is interesting to note that registered CA Trademark No 1 was claimed in 1861 by Delahanty & Skelly(DS&Co) for white paint on the bottom of soda bottles. The painted bottom idea was used by more than one soda bottler. Caduc was in Sacramento, so there was little chance of conflict over this practice. Casey & Kelley followed suit as well with trademarking their sodas with blue paint. I always thought and or was told that the color of paint on the base was to designate the flavor of the soda or mineral water. Red was cherry and yellow was lemon etc. This may or may not be true, it makes more sense than anything else I've heard.